The peril was advancing rapidly. It had appeared on the Ganges in 1817, and in the summer of 1831 the shocking news of cases in Hamburg set all England on the alert. The Government, certain that it would appear in English seaport towns within a few months, sent circulars to every parish giving advice as to how to deal with the threat. They were none too early, for in the following year, as they had predicted, cases were notified in many coastal towns from Sunderland in the northeast to Exeter in the south-west. Like the bubonic plague which had ravaged England from the fourteenth to the seventeenth centuries, it was contagious, spreading principally by infected persons going from place to p’ace, or by rags and soiled clothes. Thus it moved along the lines of communication, especially on low-lying land, in valleys and in large towns, whose inhabitants, through bad living conditions and overcrowding, were most liable to infection. From the seaboard towns it spread over the countryside. In February 1832 the first cases, were reported in London and by the summer it was widespread. The Hornchurch vestry attacked the problem with energy. Ditches and drains were scoured, privies were cleaned, publicans and shopkeepers were warned against entertaining ” disreputable persons.” An inmate of the poorhouse was given the special job of going about the town and its neighbourhood with instructions to warn off all vagrants and beggars. People who stopped up watercourses, and ditches were prosecuted and the houses of the poor were ordered to be limewashed, the parish paying the expenses of those who could not afford it Through these measures Hornchurch was spared much of the tragedy that occurred in the larger towns. In one year Exeter lost 402 inhabitants, between one and two in every 100. Cholera, like the plague, was swift in its onset and its disappearance. By the end of 1832 England was free of it, but it continued to break out in various parts of Europe until 1837, when it disappeared. The British Government had had a severe lesson and the following year saw the creation of boards of health all over the country. The next attack. which came in 1848, was neither as widespread nor as serious as the first, but it was followed by a third which affected Europe in 1853, attacked both sides in the Crimean War and appeared in England in 1854. The results in Essex were immediate. At that time Messrs. Peto. Brassey and Betts were constructing the London, Tilbury and Southend railway line. Thames-side was invaded by an immigrant population, including large numbers of navvies. These were described, perhaps unjustly, as ” loose and intemperate characters,” and the severe outbreak of cholera in places all along the proposed line was largely attributed to them. Between Pitsea and Leigh lies a long stretch of level land, once marsh, and here an embankment had to be made to provide a firm foundation for the line to Southend. For this reason the people of South Benfleet had to accommodate large numbers of these navvies. Whatever the cause, it was on South Benfleet that the pestilence fell like a thunderbolt. The relief of those who suffered from it was largely the work of one man. the Rev. John Aubone Cook, who was vicar of the parish at the time. Mr. Cook, though a quite unknown figure today, deserves to share with Captain Oates., Lord St. Vincent. Sir Evelyn Wood and many more the designation of – hero.” for to save others he placed his own life at enormous risk and in the end sacrificed it. He was born in Essex, at Pilgrim’s Hatch, near Brentwood, in 1811, the son of a cavalry officer. Much of his boyhood was spent in France, where his family went to live until the death of his father in 1829. Cook’s original intention had been to enter the Army, but since the family’s resources were only enough to buy one commission he gave way in favour of his younger brother and took holy orders. His first appointment was as a curate at St. Margaret’s, Westminster, and here, working among the poorest of the parishioners, he saw the worst of the cholera epidemic of 1848-9, never hesitating to enter infected houses, to pay regular visits to the sick and to do all he could to help stricken families. In one week of 1849 he conducted the burial services of no fewer than fifty victims. In 1850 he was appointed to the vicarage of South Benfleet, and in 1852 was made rural dean of Canewdon. Two years later his parish felt the full impact of the third cholera epidemic of the century. Mr. Cook, fortified by the knowledge that he had come through the last attack exhausted but without catching the infection, began his second fight against cholera. He visited the sick and dying from week’s end to week’s end. For seven whole days and nights he never went to bed, hastening from house to house, going for hours without food, giving out medicines, rubbing the cold and numb limbs of those who were in collapse and praying with the sick and dying. In the interest of others he forbade anybody to go with him, and he gave the same attention to strangers, the drunks and the blasphemers as he did to the most pious members of his own congregation. To all these he was priest, nurse, doctor and confessor. Fetching and carrying, washing and cleansing, he lived for months in the atmosphere of stench, effluvia and decay, burying the dead whom he himself had visited and nursed. The complete record of all this man did for his parishioners was never written down, for he would not speak of his own good deeds even to his friends. One true story is, however, related by a neighbouring clergyman who made inquiries and checked it. A traveller who had been taken ill with the cholera had fallen by the wayside and lay helpless. Nobody dared touch him or go near him for fear of catching it, but the news of the poor man’s plight spread by word of mouth through the village. In the end one of the parishioners, a nonconformist, boldly approached him and helped him to his feet. As the two passed slowly along the village street not a single householder would open his door to them. Slowly the two men mounted the hill to the vicarage. When they reached the door the poor traveller collapsed, shrieking in agony. The vicar came to the door and the two, vicar and nonconformist, carried him upstairs and put him to bed, where he was nursed until he recovered. When the epidemic had run its course Mr. Cook continued his parochial work. In 1857 he became incumbent of the small church on Canvey, which he served in addition to his church in South Benfleet. Had he considered his own interest alone he would never have accepted this additional commitment, for he was already suffering from repeated attacks of malaria and neuralgia, which short periods of absence from the marshes relieved but did not cure. The hot, dry summer of 1859 was followed by the usual round of marshland illnesses, diarrhoea, pains in the limbs and fever. The vicar’s presence was requested everywhere, and his visits increased in number. On Saturday, September 10, he left home at midday for a round of visits on Canvey and was still on the island when darkness fell, having lost his way. He did not reach home until ten at night, ill and exhausted. In spite of this he was determined to face the next day’s work, which included services at Benfleet, on Canvey and again at Benfleet in the evening. At the end of the day he took to his bed with a high fever and never recovered. His death at the early age of forty-seven was deeply mourned. We would have known little about this Essex hero but for the work of another clergyman, William Edward Heygate, the poet, novelist and antiquary. Heygate was born at Porters, Southend, in 1817 and was a member of a prominent local family. When Cook died he was curate at Hadleigh. 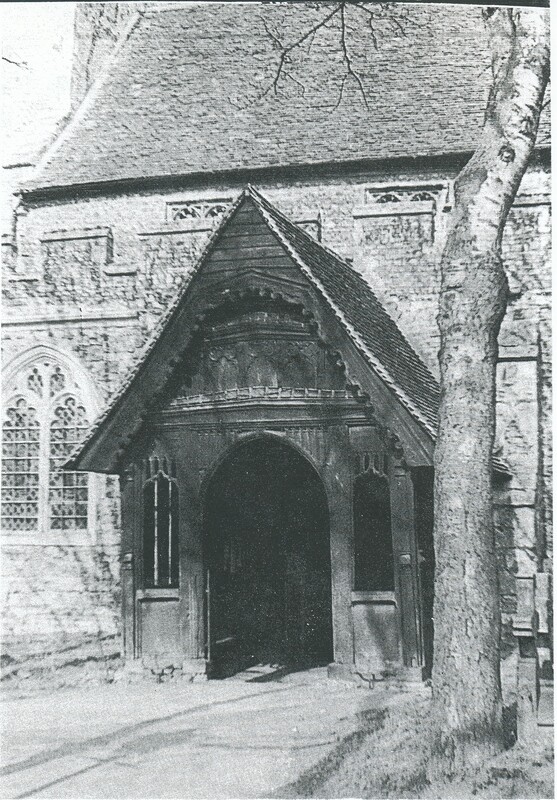 At that time the lovely medieval church porch at South Benfleet was falling into decay and the vestry was thinking of taking it down and replacing it with a new one of brick. 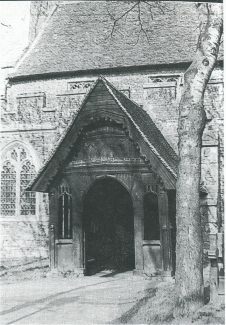 Mr. Heygate, great friend of the deceased vicar and keen preservationist, persuaded them to restore this old porch, and to help with the expense he wrote a memoir of his friend, which was published in 1860 and which readily found sales in south-cast Essex. A very few copies remain in existence today. The church porch at South Benfleet. with its hammerbeam truss and its rich medieval decoration, is one of the finest antiquities of Essex, a fit memorial to a great and heroic figure.